5/19/13 - The MM 2A (2nd Amendment) Patch is a simple way of showing your support for the 2nd Amendment to the United States Constitution - which protects our right to keep and bear arms. This PVC patch is only available in a set of three different colours, exclusively through EMDOM USA. A portion of the sales of the patches will be contributed to the NRA, which spearheads the legislative battle in our fight for our RKBA. Background - I've had the idea of this patch for a while; a design that would enable patriotic Americans to show our support for the Second Amendment to the United States Constitution. I was born overseas, in the United Kingdom, which is a country with very strict gun laws, and had an affinity for guns as far back as I can remember. As I grew older (and later moved to other countries), my interest in firearms grew, and I bought books about them so that I could understand the different designs. When I moved to the U.S. in 1984, as a teenager, I finally was able to do what I had always wanted to do since I was a child: start shooting. It's been 28 years since I owned my first firearm, and since then, we've all seen many changes in the gun laws. I've seen many military-style weapons that were readily available back in the late 80's disappear from gun store racks as Assault weapon bans drove up prices and banned importation. I've seen law-abiding gun owners turned into criminals retroactively just because their black rifles had features that were deemed to have 'no sporting purpose'. The 2A battles foughts in the past few months have been some of the most public, as the anti-gunners tug on the publics' emotions rather than use fact and logic in their arguments. We recently had a victory when the assault weapons ban was dropped from the Manchin-Toomey gun control bill, and the bill itself was defeated. But it's definitely not over, and now more than ever, we need to stick together and fight for our rights. Part of that is educating the uneducated. I came up with the 2A patch idea as both a means of declaring and showing our personal support for our 2A rights, and also as a conversation starter, to help spread the word, or engage others in meaningful discussion (hopefully). 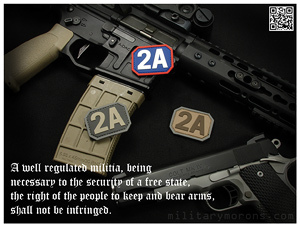 Rather than a graphic with guns or a lot of text, I decided that a simple '2A' was all that was needed. It'd be clear to those who know, but may not be to those who don't. That's where the patch may help start conversations when people ask 'what's 2A?'. It's a simple, non-threatening design and crystal clear statement (when you explain what it means). I liked the 2" x 1.5" size of my MM Skull PVC patch, so I decided to stick with that size. I drew up a design in photoshop, and contacted Monkey over at Milspecmonkey (who produces my MM Skull patch) to help finalize the patch colours and design. I chose the colours of the 2A patch from MSM's existing PVC patch colour palatte. EMDOM USA financed the production of the patches and they're available exclusively through EMDOM as a set of three. Urban - Urban, SWAT, subdued grey etc - whatever you call it, the Urban colour scheme was chosen to go along with a variety of colours. I wanted to go for a nice low-key, low contrast look; hence the combination of khaki lettering, light grey border and dark grey background. It goes well with all the standard urban colours, and doesn't look out of place on MultiCam either. Arid - The Arid colourway consists of dark brown lettering, light grey border and tan background. These colours are quite similar to those found in desert MARPAT, and also go well with Arc'teryx's crocodile, tan, khaki, brown, and MultiCam of course. Patriot - Needs no explanation; these colours go with EVERYTHING. I hope you wear your 2A patch with pride and patriotism, as we continue the fight to uphold our constitutional rights. IT IS A COPYRIGHT VIOLATION!